When we Bangaloreans think budget shopping, we think Commercial Street. 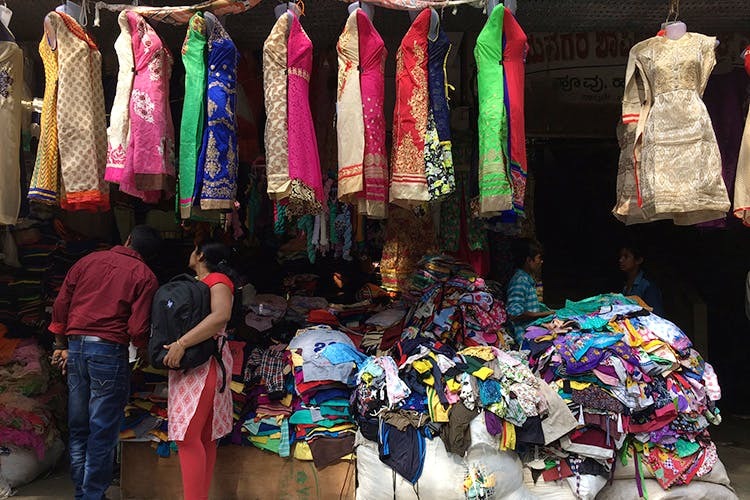 But what if we told you Jayanagar has a shopper’s paradise of its own with everything from readymade blouse pieces to gladiator sandals at great prices. Jayanagar’s shopping complex delivers on the clothing front as we could see literal heaps of clothes for sale and we hadn’t even gotten into the building yet. With big blue sheets spread out on the ground, they were selling everything from cotton kurtas for as less as INR 100 to readymade blouse pieces for around INR 250. And this is just outside. Make your way into the building and find it all from colourful dupattas to frocks for little girls at impossibly good prices. We found a rack of beautifully printed palazzo pants and long skirts for INR 300. There are also a decent number of stores that only sell men’s clothing with formal shirts, t-shirts and comfy reliable hoodies on their shelves, so no one feels left out here. Although some of the stores here sell on a fixed price system, you can test your bargaining skills with most of the shops here and score yourself an even better deal than the ones they’re offering. We saw what we can only describe as shoe curtains that we literally had to push shoes aside to get by. Ballet flats, strappy sandals, desi juttis and chappals of every colour in the rainbow, we found it all here. And there were also our good old Pick Any sandal shops that were selling these babies for as little as INR 100. The sheer volume and variety of shoes here are enough to baffle you. And their incredibly low pricing is simply the cherry on top. We must warn you that these shoes don’t look like they’re built to last, but that just means you’ll need new shoes sooner, which, if you really think about it, is actually good news. We spotted little shops selling watches, earrings, chokers and those flower crowns everyone seems to be wearing these days. With jhumkas, hoops, and earring studs, this place is bringing the bling in. We also found cute hairbands and hair clips with butterflies and bows on them that are sure to up your outfit’s cute quotient. This place also has all those extra fittings like tassels and ribbons to take to your tailor and add a little something extra to your clothes to make them stand out. So what’re you waiting for? Head on down to Jayanagar’s 4th Block soon. Shopping calls!